Up until a few years ago, I hated eggnog. I found the yellowish drink to be a cringe-inducing substance, a slimy liquid custard. Every year around this time I would sample it, and every year I would come to the same conclusion: not for me. That all changed when I tried the eggnog from a local NC dairy called Maple View Farms. Located in Hillsborough, NC, Maple View Farms is responsible for changing my mind about the seasonal drink. (They also make the best chocolate milk in the world.) Creamy and rich, it tasted like a glass of melted eggnog-flavored ice cream. Since moving away I’ve been on the quest to find an eggnog good enough to challenge theirs, but haven’t come close until now. 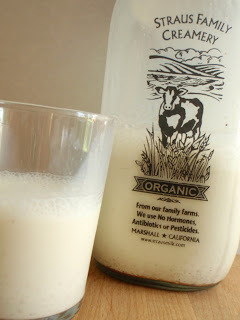 The Straus Family Creamery, located in Marshall, CA is one of the best eggnogs I’ve tasted since leaving Chapel Hill. It meets all the requirements on my list for nog consideration: it comes in a glass bottle, it’s from a local dairy, and the cows are happy. You’ll immediately notice a few things about the eggnog that sets it apart from the others out there. First, it’s not yellow. I must admit that this took some getting used to, like the first time I had mint chocolate chip ice cream that wasn’t green. Straus doesn’t add any artificial coloring to their eggnog. The second thing that will catch your attention is the texture—none of that slimy, gooey stuff in that bottle. That’s because they don’t add any emulsifiers to thicken it—their cream-top eggnog is made only with natural ingredients, and it’s organic. My only complaint is the price. A quart will set you back about $6, not including the bottle deposit ($1.50). Consider this one a holiday splurge.